This children’s book has a little bit of everything…multi-racial issues that a Mexican-American girl has to deal with; chickens and everything you might want to know about raising them; mystery – who is stealing the chickens; and friendship… just to name a few. While the mix at sometimes is a little clumsy, over all it keeps the book from ever becoming dull, or totally superficial. To be honest, what immediately captured me was that it was practically set in my town. The zip code on the fictitious Animal Feed store is my zip code! And my town, and my school’s town (Petaluma) are known for raising chickens. So how can I not love this children’s book? I certainly will recommend it to our school, since we have chickens at the school that the students care for. Overall, the book is just a good, light-weight, funny read. 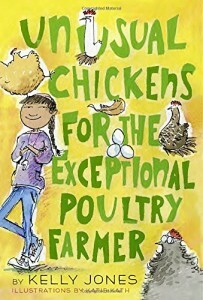 It’s a totally lovable children’s book, good for middle-school, with a very likable heroine, who is trying her best to learn all about chickens, one chicken at a time. For rural communities, this children’s book will be a hit. I don’t know how it will go over in New York City or Philadelphia! This book is a 2016 Mathical Honor book, a prize which honors books that may inspire young mathematicians.